President Trump has punted on his plans for closing the southern border, telling a group of reporters on Thursday that he will give Mexico a year to stop the flow of migrants and drugs into the US. If they fail on either count, Trump will either slap tariffs on Mexican-made cars or close the border entirely. "You know I will do it. I don’t play games...so we’re doing it to stop people. We’re gonna give them a one year warning, and if the drugs don’t stop, or largely stop, we’re going to put tariffs on Mexico and products, in particular cars. The whole ballgame is cars....and if that doesn’t stop the drugs, we close the border." It was unclear whether an agreement with Congressional Democrats would also be a condition for the border closure, after Trump said Tuesday that Congress needed to get rid of chain migration, catch and release and the visa lottery and "do something about asylum" or he would still consider closing the border. "If Mexico doesn't or we don't make a deal with Congress, the border will be closed." Over the past week, Trump has repeatedly threatened to close the Southern border, even saying that he might do so as soon as this week. His acting chief of staff took to the Sunday shows over the weekend to warn that Trump was serious about the threat, and media reports claimed the White House was looking into various plans. The decision to back down from an immediate closure order followed complaints from several Republican Senators from border states, including John Cornyn and Martha McSally. The peso has rallied on the news as pressure from a possible border closure eased. Trump Punts On Border Closure, Gives Mexico A Year To Stop ... 05 Apr 2019. Tucker Carlson delivered an epic monologue on Tuesday night highlighting how Max Boot and permanent Washington support “sending somebody else’s kids to a foreign country” to fight in neocon wars but are vehemently opposed to sending troops to our own border to protect America. TUCKER CARLSON, FOX NEWS: Here’s a helpful hint about how your government works: If you ever see consensus forming in Washington, run. Something awful is about to happen. For decades, you will remember, there was total consensus that our trade deals could not be better. They helped everyone. Meanwhile, as they were telling us that, America’s manufacturing sector died, and huge parts of the middle class died along with it. Then it was bipartisan consensus on the Iraq War and the stockpiles of weapons of mass destruction we’d supposedly find there, but didn’t. A few years later, there was a consensus on banking regulations. That was just before the financial crisis hit. Then there was still more consensus on the creation of an all-seeing surveillance state that was supposed to somehow help you, but that is now scanning your face and reading your texts. There wasn’t much debate in Washington about any of those policies. There should have been. Who is this guy? Well, Max Boot calls himself a foreign policy expert. That’s a title that doesn’t actually mean anything, but in practice, it allows Boot to agitate for more counterproductive foreign wars. In the years since 9/11, Max Boot has demanded military intervention in Afghanistan, Iraq, Syria, Libya, Iran and North Korea and likely many other places. He has called for the U.S. to topple the Saudi monarchy. And of course, like so many neo-cons, Boot fell headlong into the Russia conspiracy nuttiness for more than two excruciating years. It’s hard to think of anyone in this country more discredited than Max Boot. Going to him for foreign policy advice is like giving Jeffrey Dahmer a cooking show. He’d be the last person you would ask. So, of course, Max Boot now has gigs at CNN, the Washington Post and the Council on Foreign Relations, because that’s how Washington really works. The key is never apologize, never admit fault, no matter what. Boot didn’t explain how exactly it does work; he didn’t need to explain. Everyone knows his assumption. It’s the same as permanent Washington’s core assumption. Military occupation is always the right answer, no matter what the question is. Sending somebody else’s kids to a foreign country is always, in everywhere, the right thing to do. What did Max Boot not say? What do you notice about that? Well, he never explained how keeping Americans in Syria would help the United States. Why didn’t he mention it? Because he doesn’t care. Nobody in Washington cares, and maybe that’s why you never hear anyone ask questions about our current military commitments. Are we overextended perhaps? We have the numbers. As of Tuesday night, we have nearly 175,000 active duty personnel serving overseas, American troops are posted in 158 different countries. For perspective, there are only 195 countries total on the entire planet. We’re almost everywhere. Keep in mind there is no world war currently in progress. This is what we’ve signed up for in peacetime. And yet, you may notice that there was one place American troops are not. They are not on our southern border protecting us. They should be, we could use them. Tens of millions of illegal immigrants already live here in the United States. We don’t know the exact number. We don’t even know who they are. They just show up and a hundred thousand more are showing up every month. Over time, this is how countries collapse. Max Boot doesn’t think that’s a crisis. Nobody in Washington thinks it’s a crisis. As far as they’re concerned, illegal immigration is just some right-wing talking point that Trump throws to his base at rallies in Grand Rapids. You know what they think is a crisis? You know what they’re really concerned about? Medical care in Morocco. That’s a problem we must solve immediately. Luckily, we have Exercise African Lion. Never heard of it? You’re paying for it. In the last year, 1,100 US military personnel have participated in that exercise, all of them working to make Morocco healthier. Feel safer? The people of Mozambique feel safer. U.S. military aircraft have flown 60 missions. They’ve transported more than 663,000 metric tons of relief supplies in there in the wake of a cyclone. That was nice. In Honduras, we currently have 400 American troops stationed. Our 612th Air Base Squadron recently helped extinguish a wildfire in a small city called Comayagua. In Malaysia, meanwhile, a U.S. Navy amphibious construction battalion is rebuilding water tanks at an elementary school. And we could go on and on. Now, these are all good works, virtuous things, done at taxpayer expense, by the most altruistic country in the history of the world. That’s us, the United States. But what about us? What about our country? We’re being invaded. No offense to the Ethiopian Navy, but we could use American troops a lot closer to Tijuana than the Horn of Africa. Max Boot and his friends scoff at this. Troops on our own border? Protecting our own people? That’s disgusting. Immoral. It’s fascism. Only in Washington do people believe that. Max Boot, who works for the world’s richest man, has been relentlessly agitating for Tucker Carlson to be censored. Tucker: We Have Troops In 158 Countries But ‘Not On Our Southern Border’ 12 Apr 2019. “This was just a suggestion that was floated and rejected, which ended any further discussion,” said one White House official who acknowledged the discussions, according to the report. A Department of Homeland Security (DHS) official confirmed the discussions in “a nearly identical statement,” but asserted that the discussion is now over. The plan was reportedly pushed by senior Trump adviser Stephen Miller, according to two DHS officials; once in November and again three months later during the shutdown talks. “This was just a suggestion that was floated and rejected, which ended any further discussion,” the White House said in a statement. After the November discussions, Albence brought ICE attorneys into the picture after the topic came up again three months later, who ultimately killed the idea. Trump has been demanding aggressive action to deal with the surge of migrants, and many of his administration’s proposals have been blocked in federal court or, like the family separation policy last year, have backfired as public relations disasters. 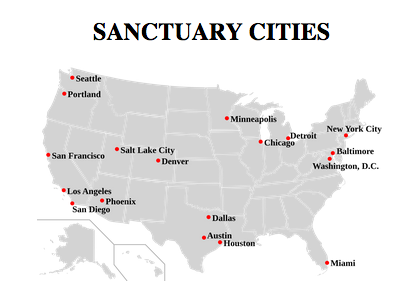 Trump has previously railed against sanctuary cities – while a January 2018 Executive Order to pull funding from the illegal-friendly cities was slapped with an immediate injunction that was upheld by the 9th circuit. 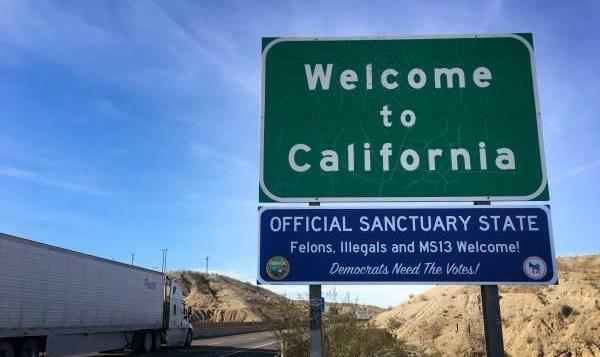 The city of San Francisco argued that the executive order violated the Constitution by “effectively trying to commandeer state and local officials to enforce federal immigration law,” wrote the New York Times. The city estimated that it stood to lose over $1 billion in federal funding as a result of the EO, while nearby Santa Clara said it would lose around $1.7 billion – or more than a third of its revenue. Trump Threatens To Dump Migrants In Sanctuary Cities 13 Apr 2019. Singer Cher, who once famously offered to take a "Dreamer" into her home and encouraged others to follow suit, is now up in arms over US President Donald Trump's proposal to funnel illegal migrants to her sanctuary city. "I Understand Helping struggling Immigrants,but MY CITY (Los Angeles) ISNT TAKING CARE OF ITS OWN.WHAT ABOUT THE 50,000+Citizens WHO LIVE ON THE STREETS.PPL WHO LIVE BELOW POVERTY LINE,& HUNGRY? If My State Can't Take Care of Its Own(Many Are VETS)How Can it Take Care Of More," she tweeted on Sunday, her style curiously similar to Trump's own. In her scorn for the proposal, Cher joins a chorus of Democratic lawmakers and progressive activists, like fellow Hollywood celebrity Alyssa Milano, who have already admonished Trump for what they see as an attempt at revenge on migrant-friendly cities, mostly governed by Democrats. The liberal outrage, however, was met with derision from Trump supporters, who pointed out that having talked the talk, Democrats and their supporters should now walk the walk and welcome the masses of Central American migrants with open arms. Cher's tweet has likewise triggered a major backlash. "Hello! Looks like you just woke up," one wrote, and many jokingly welcomed her to the conservative side. "Wow, sounds like a great reason to build the wall and stop another million illegal aliens from coming to the USA this year!" another wrote. "Oooooh, so now that it directly affects you, you change your mind? How selfishly convenient." 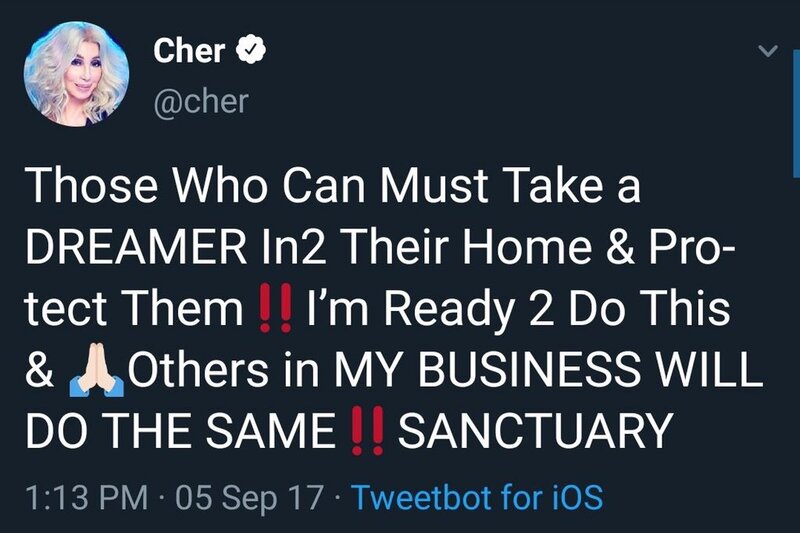 Cher struck a rather different tone less than two years ago when she literally invited illegal migrants coming to the US as minors to live at her place. "Those Who Can Must Take a DREAMER IN2 Their Home & Protect Them!! I'm Ready 2 Do This & Others in MY BUSINESS WILL DO THE SAME!! SANCTUARY," the singer and actress tweeted on September 5, 2017. In another recent tweet, Cher appeared to sound the alarm over the possibility of California being flooded with criminals, while citing Trump, who believes that groups of migrants are embedded with "rapists" and "murderers." She again faced rebuke online, with conservative commenters telling her she "cannot have it both ways." Another California NIMBY (Not In My Back Yard) and classic too. Can't have it both ways: Migrant advocate Cher blasted for opposing idea of illegals flooding LA 15 Apr 2019. I think this map is wrong. I live in the Miami area and I read that it is NOT a sanctuary city. I hope that hasn't changed.